…took the first step toward implementing utility franchise fees to create a new revenue stream. Funds would finance new sidewalk, trail and non-motorized transportation projects around the community. Currently, such projects are funded through the City’s annual Capital Improvement Plan or special assessments. The utility franchise fees are estimated to generate more than $1 million in new revenue per year. Edina City Manager Scott Neal has the full rationale in his Aug. 17 blog post, What’s a franchise fee? This goal will require resources to complete. After looking at a number of different ways to fund this goal, the Council and I settled on the utility franchise fee as our best option. Why? It has a wide base. Everyone in the community (including non-property tax paying properties) uses electricity and natural gas, so everyone will pay the franchise fee. Because the base of people paying this fee is wide, the rate of the fee itself can be low. That’s how a $2.90/month/residence franchise fee can generate over $1 million a year in revenues. We really need a way to pay for new sidewalks that’s not so onerous for the residential property owners along streets where none exist, for example, Woodley. And yes, bicycle-related infrastructure, too. Having a tax that everyone would pay, including schools, colleges, churches, and non-profits, is especially appealing. Basically it is rather disingenuous to call it a “franchise fee”, IMO, because we pay for the Xcel electric and gas that we use, and there are no competing companies to have a preferred one be given/awarded the “franchise”. It’s really just an additional tax that the City would allow Xcel to impose on its customers, and the city would be reimbursed for that amount, or a portion of it. As I remember, the amount of revenue that would be raised for NF by imposing this”franchise fee” would be about 250-300K. So it’s a way for the City to raise an amount of $$ by spreading that burden over all it’s Xcel customers. But if I am recalling the discussions correctly , this would be quite a burden on the colleges. Now … I am certainly not opposed to reasonable taxes, and don’t mind paying what is equitable, but I think that calling it a “fee”, rather than a tax, is just ‘the honey that makes the medicine go down’. So the basic question is: if the city needs more money to fund ??? then put it in the tax levy, and in the budget, but don’t team up with the single utility provider to award it a “franchise” for providing what its customers already pay for. 1. If we tax the residences, taxing the churches, schools, and other non-profits results in a taxation for non-taxable entities. Churches don’t ride bikepaths; people do. Businesses would also pay taxes even though businesses don’t ride bikes. So, Ludescher would have to pay at home, at the office, and at St. Dominic Church so you can have a bike path. 2. People outside of Northfield’s taxing authority don’t pay anything, but get to use the facilities that they didn’t pay for. 3. The tax is disproportionately burdensome on those who don’t have much disposable income (i.e. the poor), and who have to pay a larger percentage of their income for necessary utilities. Their utility rates will be above costs, so that the City can fund some non-essential project. Whether any particular bike path (or streetlight, sidewalk …) is a good or bad investment (sorry, David) completely aside, paying for such things with a dedicated “utility franchise fee” (UFF) makes no sense to me, for several reasons. Reason 1: I see no plausible connection between Edina’s UFF and the particular projects it would apparently fund, so it seems illogical to tie one to the other. Reason 2: The UFF pretends to go after big bad Xcel (or Xcel-substitute). 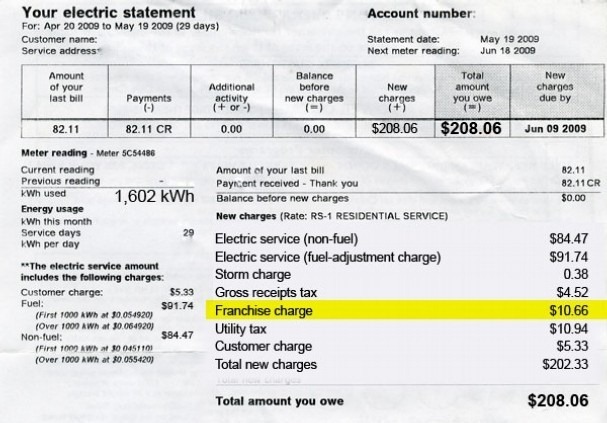 But the fiction is insultingly transparent—Xcel just passes the costs on. Apparently everyone agrees that (or was put to sleep by) the idea of utility franchise fees as a funding stream for sidewalks, bike paths, trails, etc. We really need a way to pay for new sidewalks that’s not so onerous for the residential property owners along streets where none exist, for example, Woodley. Yes, Woodley should have sidewalks, and they won’t build themselves. Who should pay? One possible answer: Sorry it’s onerous, Woodley-folk, but new sidewalks in your neighborhood keep your kids safer, spruce things up, and raise your property values. Many of your co-townsfolk on the East side, for instance, ponied up big-time for new sidewalks and other infrastructure improvement. Some of you have been seen walking on those very sidewalks. It’s your turn to pay. Another possible answer: Nobody walks only in his or her own neighborhood, kids’ safety is everyone’s concern, and property values anywhere in town affect those everywhere else. Adequate sidewalks are good investments in maintaining Northfield’s high quality of life. So we should all pay, through general city revenue, and walk guilt-free anywhere in town. Is either of these answers right? If some “weighted average” is better than either extreme, what should the proportions be? Councilor Buckheit: In your welcome and thorough explanation in #6 about NF’s sidewalk policy , you gave a good explanation of current and some recent practices. However, you did not address at all the basic philosophy of a UFF, as Paul calls it, and the necessity (?) of using what is , in his words, “an insultingly transparent” pass through. I think there is no reasonable citizen that would object to the council budgeting money for sidewalks, supporting the concept of improved connectivity, and therefor not applaud the council for putting that in the budget, as the levy determination time approaches. It is the , IMO, ridiculous idea of offering a UFF, to an entity which need not bid for a franchise since they are the only supplier of gas and electric , that is just the sort of circuitous talk that is ruinous to the image of councilors who should be able to talk straight , listen to their residents, and vote on principal of good governance rather than on personalities, or some sort of positioning that might appear on the surface, to lessen conflict. Paul (and Griff), the City of Northfield does not currently assess property owners for new sidewalk construction. The cost to property owners comes in the form of the obligation to shovel snow and keep the sidewalk clear. The franchise fee discussion the Council had with its Ad Hoc Finance task force proposed directing fee revenue to street improvements because of the close connection between a fee for right-of-way access along streets and street improvements. Street improvements includes sidewalks and other non-motorized transportation improvements and is planned according to our Safe Routes to School plan and (new) Complete Streets policy. Woodley is an interesting example because it is planned for improvement between Prairie and Division in a few years, but also because it is a County road which means Northfield shares the cost with the County and brings County design issues (like no sidewalks). Our Safe Routes and Complete Streets policies, on the other hand, guide Northfield to improve pedestrian/bike safety and access on this street. In the eastern segment from Prairie to Jefferson Parkway, there was much negotiation about adding the path on the north and sidewalk on the south side of the road because these were not part of County road sections. I believe the City had to pay the full cost of the path and sidewalk, while the road was a cost sharing arrangement. But doesn’t the City still assess adjoining property owners for street improvements? If I recall, the Fifth Street property business property owners were assessed when the street was redone. Kiffi, I think of a UFF as one of the relatively few ways a city could diversify its revenue sources to take some of the burden off property taxes. We can spin UFFs as a craven, underhanded attempt to hide tax increases and make the colleges pay for something, which seems to have been the general trend here on LoGro. Or, we could look at UFFs a one tool – along with a local sales tax, shifting some of the street reconstruction burden to the utility funds, adjusting rates/fees – we might employ as part of the total financial picture – each comes with pluses and minuses. It was openly acknowledged in the Council discussion that UFFs were charged to the utility, but would be passed along to the consumer and that this would broaden the pool of payers to include all utility customers including colleges, churches, non-profits who pay no property taxes. The Council has tried to look broadly and our Ad Hoc finance task force identified this as one potential option, and that’s where it still is. UFFs at the consumer end have the slight advantage that conservation could help lower the cost – use less electricity; pay less. You can use as few city services as possible, but this won’t lower your property tax bill. My support of a UFF depends on whether it is part of the bigger policy picture of how we fund city services in the long term. UFFs are no silver bullet, but might provide a reliable funding supplement for streets. Transparency about what UFFs are and why we would be adopting one should be an integral part of the discussion. Thank you for the good reply… All of the reasons to have a UFF are here in your reply, but I still find it rather ‘silly’, in that we have basic policy laws about churches and colleges not paying taxes, and I am supportive of those policy laws. I don’t think either churches or colleges should pay taxes, and neither should most non-profits. ****But if the two most basic charges to local government is to maintain infrastructure and provide for the health/safety/welfare of the people in its jurisdiction,then the costs of those two basic responsibilities should be the base of the city budget. If the city cannot fund those most basic charges through the property tax base, then I would suggest there are other ‘spendings’ that are possibly out of line relative to what the city can afford, or the tax base support. The first step in transparency is to call the UFF’s what they are – a surtax on a private utility charge. Transparency also requires that we admit that it is a tax that is not subject to the levy requirements of statute nor is it related to the value of the goods and services received (like it is with water service, and to some degree sewage and storm water). I am also very hesitant to raise taxes without controls specifically detailing the permissible use of the expenditures. We have that problem now with the Streetscape money. We are using downtown taxpayers property taxes to build what is dishonestly called “infrastructure” and which is, in all transparency, of little value to the businesses. We are spending $1.6 million of taxpayers’ dollars to build an underpass on Highway 3 which has no value to most of the town, and little value to some of the town. If we raise $500,000.00 through the utility surtax, what guarantee does the citizenry have that the money won’t be used to the next special interest project? In my opinion, before the Council starts looking for “additional revenue sources”, i.e. taxes, it should prioritize spending. David: I must strongly disagree with your evaluation of the value received from the Hwy 3 trail project. You seem to think that a project must be used by most /a majority of the town to be of any value .. but as I said above, the health/safety/welfare of the residents of a community is one of the most basic charges to that local government. … and some better access to the downtown from the north Hwy 3 area is imperative , IMO. Because I live on St. Olaf Avenue I am often sitting in my car at the intersection of St Olaf and Hwy 3; there are way too many times I see people, usually women pushing a stroller and/or with a couple of toddlers in tow, walking on the very narrow sidewalk right next to the east side of the highway. It is a serious and unnecessary accident just waiting to happen. The City has a responsibility to all its residents to provide safe infrastructure patterns… you can argue all you want about the specifics of this project, but there is no question that it is a pressing need. Thanks for the information on existing City sidewalk policy. My reference in #5 to some East-siders having ponied up for “new sidewalks and other infrastructure improvement” was inapt in (at least) two ways: (i) I really meant West side, not that it matters; and (ii) by “new sidewalks” I meant “newly laid”. When Manitou Street infrastructure was renewed (in 1997, I think) homeowners were assessed a substantial amount. No complaints; the improvements were needed and welcome. But I understood then that homeowner assessments like these include a payment for rebuilding sidewalks. No? In any event, my beef with the UFF-to-fund-sidewalks-and-trails (UFFTFSAT) model has nothing to do with how, if at all, it might affect colleges and their tax-exempt buddies. That’s a fight in which I have no dog. My big UFFTSAT problem relates to your (good) point about the need for a big picture approach to funding city services in the long term. Tying particular revenue streams (like UFF) to particular purposes (like FSAT) is usually a step in the wrong direction.